BAINBRIDGE, Ga. — The city of Bainbridge is one step closer to letting liquor stores sell beer, wine, and other spirits on Sunday. Several years ago, Bainbridge residents voted to allow restaurants to sell alcohol on Sunday, but did not approve for liquor stores to sell. In February, one Bainbridge merchant asked the city council to consider “Sunday alcohol package” sales for liquor stores and other retailers. Just last month, a motion was made to put this referendum on the November ballot for voters to decide on. According to Chris Hobby, Bainbridge City Manager, many surrounding communities already allow for “Sunday alcohol package” sales. "I don't think that because you can't buy it in Bainbridge that people are not buying it anyway. They're just simply going to where it's allowed, either just across the Florida line, or even just up the road to the city of Climax," said Hobby. 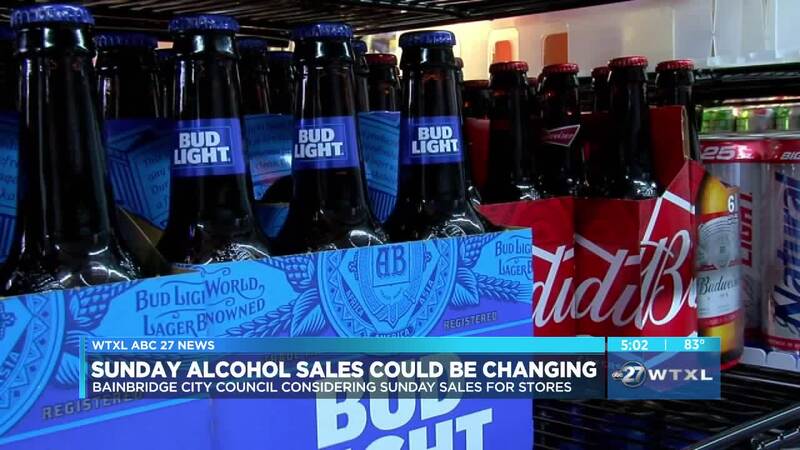 While Hobby doesn’t believe that this change in alcohol sales will make a if difference for the city, he does believe that they are missing out on some revenue. The next city council meeting is April 16 at 6:30 p.m.
Everyone is invited to hear more about the proposal and share their opinion on it or any other city matter.